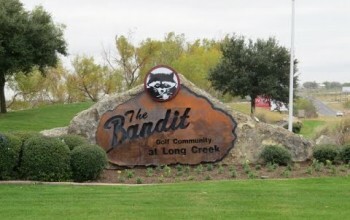 Long Creek at the Bandit Golf Club is a gated community in New Braunfels with private roads which are maintained by Long Creek Owners Association as well as the common areas. There is a pavilioned park on the banks of Guadalupe River, a private marina where residents may fish, swim and have a picnic, or dock their boats. The Bandit course designed by noted architect, Keith Foster is 6,928 yards of golf from the longest tees with a par of 71 although multiple tees insure you play from the length best suited for your enjoyment. The course winds in and around Long Creek and Lake McQueeney and makes good use of all the natural hazards these two bodies of water create. Significant elevation changes create spectacular views that lead to the sculpted fairways and perfect greens. Great conditioning is always part of the Bandit experience in fact it is these characteristics that likely contributed to The Bandit being named a “Top 10, Public Course in Texas” by Golfweek magazine.